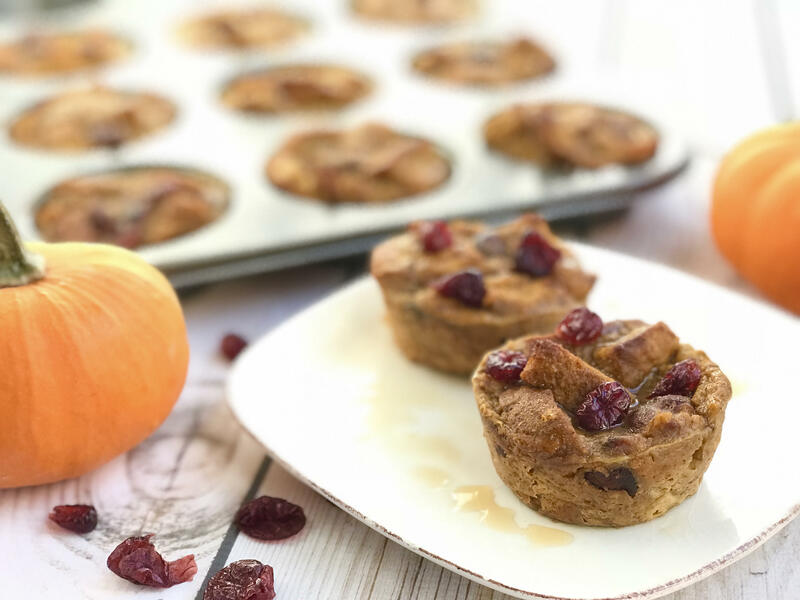 These Pumpkin Bread Pudding Cups are a guilt-free way to enjoy fall’s favorite flavors with only 70 calories each! Bread pudding is always a treat, though it’s usually very rich and packed with sugar, fat and extra calories. These Pumpkin Bread Pudding Cups contain only 70 calories each, with 1.5g of fat, 14 g carbohydrate and 3g of sugar! What a guilt-free way to enjoy one of fall’s favorite flavors! I’m all for single-serve foods. Since most people (including me) have issues with portion sizes, muffin tins are an easy way to bake perfectly sized cups. Enjoy one for a light snack or two for breakfast paired with a protein source to round out the meal. There are so many ways to alter this recipe. I originally started with the cinnamon raisin vibe but I’ve been so obsessed with cranberries lately I had to try the pumpkin-cranberry combo. Try adding other dried fruit like raisins, prunes, apricots, pineapple, or blueberries to mix it up. If the bread is fresh, the recipe will be really moist. If it’s on the way to stale, the bread pudding will have a little more body. For food safety purposes, this recipe requires refrigeration after baking. Simply microwave or toast before serving. For breakfast, top it with some vanilla Greek yogurt or cottage cheese for extra protein. A smear of apple butter or nut butter is tasty too. Add frozen yogurt/light ice cream or whipped topping for dessert. Yum! These Pumpkin Bread Pudding Cups pair perfectly with this month’s Recipe Redux theme of “Naturally Colored Holiday Treats and Trimmings”. What screams fall holiday more than pumpkin and cranberries? Serving these as a small dessert on the Thanksgiving table would be a great idea, right? Spray muffin tins with nonstick spray (I used coconut oil spray but any will suffice). Place the bread cubes into a bowl and sprinkle in dried cranberries and set aside. In a separate bowl, add pumpkin and spices, mix well to avoid clumping of spices. Add remaining ingredients and whisk until well combined. Pour liquid mixture over bread, making sure to evenly distribute throughout the bowl. Let bread soak for 1/2 hour, then preheat oven to 350F while placing mixture into 12 muffin tins, approximately 1/3 cup each. Bake for 40 minutes or until completely set and nicely browned. Let cool until bread pudding is warm but not hot. Remove from tins. Optional: Top each with 1/2 teaspoon pure or sugar free maple syrup before serving. Make sure to store leftovers in the refrigerator or freezer. *This recipe originally published in 2014 has been updated and the nutrition facts have been recalculated to reflect the changes. They look delicious and sound really tasty as well as healthy! Thanks! The secret to keeping the calories low is ditching the added sugars and using “light” bread. Bread pudding is one of my family’s favorites! Love the single portion – these would be great for work parties too! Thanks, Kelli! Great idea for work parties! I love all the ways that you can serve these! Thanks, Karman! They’re a favorite for sure.